It is a story that's captivated the imagination of many generations. Mourning the death of Jesus, two first-century travellers were joined by a mysterious stranger. Over the next few hours, the stranger revealed many mysteries that lay hidden in the ancient Scriptures. Soon, the purpose of Jesus' life became clear...and the travellers' sadness turned to great joy. Starring Bruce Marchiano of The Visual Bible: Matthew and Acts. 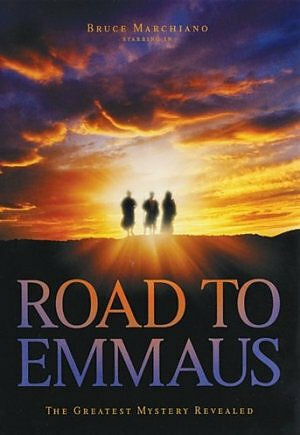 Road To Emmaus DVD was published by Vision Video in October 2010 and is our 1078th best seller. The ISBN for Road To Emmaus DVD is 727985013541. In spite of some finding the actor's American accent a bit off-putting, this is an awesome overview of God's plan to send His Chosen One, from Noah to David, with references from the prophets. One young person who viewed this said 'Everyone in the church should see this!' Makes a well-known account come to life in a realistic way. The 30-minute length makes it ideal for use in meetings, homegroups etc. Got a question? No problem! Just click here to ask us about Road To Emmaus DVD. Please can you provide a brief summary of the content of the 'Road to Emmaus' DVD? A:This DVD is produced as a modern adaptation of the story told in Luke 24, and has a running time of 30 mins. Mourning the death of Jesus, two travellers are joined by a mysterious stranger, who reveals various secrets contained in the scriptures; gradually, the purpose of Jesus' life becomes clear and the travellers' initial sadness turns to joy. What is the total running time please? A:The Road to Emmaus has a running time of 30 mins; it depicts Jesus' fulfillment of the messianic prophecies from the Old Testament.